Should you self-publish short fiction? I only have half a dozen published short stories to my name, mostly because I'm too lazy (busy) to finish off the hundred or so gathering dust on my hard drive. Those six published stories earned me a one-off payment of $50-$100 each, which varied depending on the length and the particular market. However, in October last year I put an original 8000 word Hal Spacejock short story on Amazon.com, Amazon.co.uk and Smashwords. Was it worth it? Read on. I've just been putting the finishing touches to a nifty little program* which takes those monthly Amazon sales spreadsheets and allows you to extract all the data and generate new (and much more useful) reports. For example, I had no idea how many copies Hal Spacejock: Framed had sold, nor how much royalty it had earned me. Now I do. Since it went up on Amazon, last October, Framed has sold 252 copies at 99c each, plus another couple of dozen via Smashwords. My royalties work out to a smidge under $100. In other words, about the same as all my other short stories. Whoopie-doo. But hang on a minute. What about the next six months? The 12 months after that? The next five years? What if I finish off 50 short stories and put them all online? Offered them in collections, both ebook and paperback? Bear in mind I have almost one million words of unused, unfinished Hal Spacejock scenes sitting on my hard drive, many of them self-contained vignettes which I cut from the novels. I love writing new stuff, but turning a few of those scenes into short stories and novellas makes sense. First, because it gives fans something new, second because Amazon and Smashwords are the perfect market for shorts and novellas, third because it increases my Amazon footprint, and finally because they're not making any money sitting on my hard drive. You'll find my Amazon footprint here. 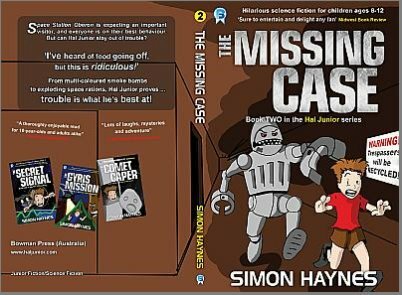 A few days ago Hal Junior 2: The Missing Case went live. It's already started selling and initial feedback has been great. And now, my first short story collection has just been published. 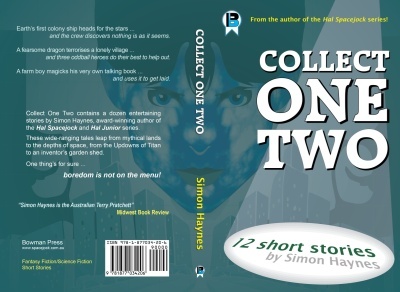 Collect One-Two contains a dozen assorted tales, from science fiction comedy to fantasy send-ups to mild horror (morror?) and everything in between. Do I regret self-publishing the Hal Junior series? I like to take stock now and then, reviewing past decisions so I can learn from mistakes and do more of whatever happened to work. 1) I can't handle the incredibly long lead times between handing in a finished book and seeing it released. 2) With a trade publisher, once it's published it's done, and everyone moves on to the next shiny. Me, I like to experiment with different ebook covers, add links to new titles to the back of the old ones, maybe refresh the cover art from time to time. I believe books are a living thing, not something you carve out of stone and put on display. 3) This is the biggie. I can't start reading a series unless I have book one. If books one and three are available but book two is out of print, forget it. If there are gaps, I'll walk away from the whole thing. By self-publishing in ebook and print, all my titles are available now, and they always will be. I've had four books released through a trade publisher (over a period of 5-6 years) and it was fun, educational and exhilarating. By the time book five rolled around I was over it and I wanted a new challenge. It got so bad I put the manuscript on hold and wrote three books in a new series, just for the hell of it. So, in hindsight, was self-publishing Hal Junior the right decision? Answer: of course it was. Nothing has changed since I released the first book. My goal is to build an audience for this series over time, with worldwide ebook and paperback releases. No threat of cancellation, and no pressure. 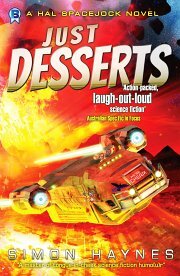 Just a bit of fun writing them, a bit of fun drawing silly illustrations, and then a lot of fun getting each title ready for release. FUN is the operative word, and while it's fun I'll continue to write and publish new work. I've just released the second Hal Junior book with no fanfare whatsoever, and it's already started selling. Now I'm putting the finishing touches to book three, and book four is half done as well. I'll keep putting them out there, because I think you need three or four books in a series available before it has a chance to catch on. If you dream of having your book published by a big-name house, and seeing it available from bookstores across the planet, don't give up. I'm not trying to push one form of publishing over another, I'm just explaining why self-pub was right for this series, and for me. 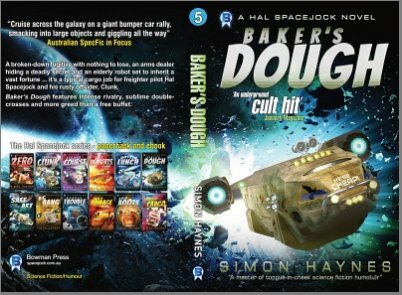 And so, my attention turns to Hal Spacejock 5: Baker's Dough. Two more editing passes and a cover should do it. NEXT week I'll probably have another similar list. 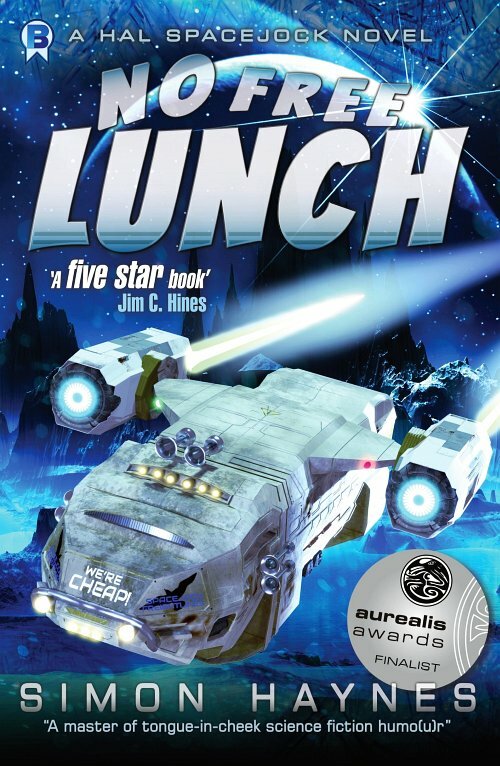 New cover - Hal Spacejock 4, no free lunch. I bought myself a Wacom Intuos4 drawing tablet last week, and I've spent the past few days learning to draw. After a bit of practice I decided to have a go at some new covers for my books. I've redone books 2 and 3 so far, and I'll paste book 4 when I replace that one too. 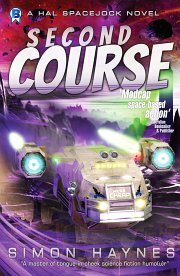 I'm not claiming to be anything more than an amateur, but my goal with these covers was to stand out on Amazon amongst the endless star-filled backgrounds with planets and spaceships. The other great thing about ebooks is that I can continue tweaking and uploading these covers as I improve my skills.